“I had a farm in Africa…” These familiar words begin Baroness Karen Von Blixen’s story of her life on a coffee plantation in British East Africa, first in a novel published in 1937, then in the film starring Meryl Streep released in 1985. It was this film, Out of Africa, that enchanted me as a college student. I hoped to one day see for myself the beautiful landscapes, the great creatures in the wild, and the native Masaai warriors and Kikuyu tribes who lived in harmony with the land, but not always with each other. It wasn’t until last summer that my dream started to take shape. 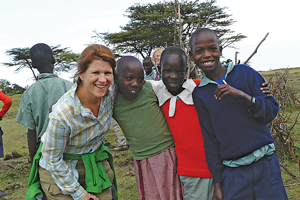 After a banking career and raising two boys, I began act two as an independent travel advisor and the company with which I was affiliated offered an educational trip – to Kenya, of all places! I was actually going to visit the home of the Baroness Von Blixen and her coffee plantation, go out on safari, and experience some of the wonders of the great continent of Africa. I was thrilled, but a bit sad that I was going without my boys who had grown up with The Lion King, singing “Hakuna Matata” along with Simba, Timon, and Pumbaa. I pledged to return with them, prepared with advice and expertise for planning my family’s trip and my clients’ adventures as well. Trip preparations included a few vaccinations, a prescription for anti-malaria tablets, the purchase of the best binoculars I could afford, a protective hat, and a few items of expedition-style clothing. Thankfully, I already owned a great camera with a decent telephoto lens. The flights would be long, and I prepared for them with helpful sleep aids and a few movies on the iPad, including my colonial Kenya primer, Out of Africa. The long flight from London ended in Nairobi in the evening, and we were greeted by our tour guides for the drive out to the suburb of Karen, where the Baroness lived, and where we would spend some time recovering from the journey and begin our introduction to Kenya. I was joining a group of twelve fellow advisors and we gathered at the well-known Scottish-style Giraffe Manor. This inn is luxurious and picturesque, with gourmet meals and round-the-clock, all-inclusive service. 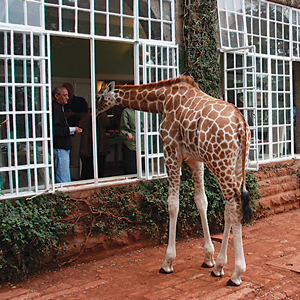 The property is next door to Nairobi’s Giraffe Center, and the long-necked residents are permitted to visit the manor for breakfast. As we enjoyed coffee delivered to our balcony, we watched them lumber across the lawn. Downstairs, we greeted them at the open dining room windows, fed them from our hands, and stroked their necks. We eventually became brave enough to receive a gentle giraffe kiss by putting the food pellet between our lips. Giraffes are silent and elegant creatures, and to engage with them so intimately in this setting was quite memorable. In a matter of hours, Africa was living up to my expectations. While the others enjoyed the serene grounds of the Manor, I was off later that morning to explore the area, especially eager to visit the location and setting for Karen Von Blixen’s story, her home from 1917 until 1931. 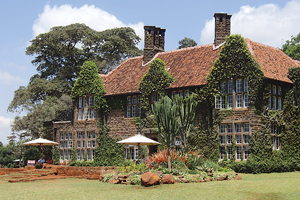 While much has changed since the days when Kenya was a British colony, the home is now a museum and looks just like it did in the movie, which was filmed at the property and around Nairobi. Many of the familiar props and costumes are on display, as well as an authentic representation of farm life at that time. For a devoted fan of the film, it was quite a thrill to be on the set and replay the familiar scenes in my mind. After our respite in Nairobi, we were ready to head out on safari.Leaving the city in our Land Rovers and driving north, our first stop was the Mount Kenya Safari Club, a luxury resort and club opened in 1959 with members including Bob Hope and Bing Crosby and a celebrity-decked guest list. It’s a less-adventuresome option for those seeking a little safari by day, but preferring to dress for an elegant dinner and sleep in a proper luxury hotel room at night. An afternoon horseback ride in the adjacent Mt. Kenya National Park led to our first wild animal sightings: elephants, zebras, monkeys, and the fearsome Cape buffalo. This was a bit like riding through a zoo, minus the fences and Don’t Feed the Animals! signs. It was terrific, but I was ready for the real deal: tented camp in the bush. Back in the safari vehicles, we continued northward, visiting the Sweetwaters Chimpanzee Sanctuary created in partnership with the Jane Goodall Institute. We took our first game drive through the wildlife sanctuary there, spotting more elephants and monkeys, and exotic birds so fantastically colored they could have been from a cartoon. Our day ended at the remote and vast Lewa Wildlife Conservancy, a privately-run, 62,000-acre property dedicated to the preservation and protection of Africa’s rare black rhinos and Grevy zebras. 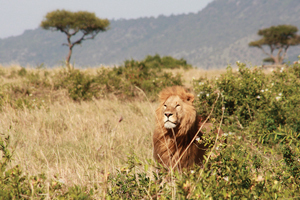 When visiting a private conservancy, you are among very few humans, but surrounded by thousands of beasts. You are truly immersed in the wild. And believe it or not, it was here in the wild that I discovered the true meaning of luxury travel in Africa. As we pulled into camp, we caught a glimpse of our lodging for the next three nights. From a distance, they looked like fairly decent, large green tents. I had spent heavenly summers at camp in West Virginia, sleeping on a cot in a platform tent by the Greenbrier River. I’m an outdoor girl. These days, our annual family camping trip features some pretty decent appointments, but this was something to behold. Can a tent have a patio? These did, with washbasins and mirrors, camp chairs and coffee tables. Inside the tents, there were full-size beds with pillows, and bedside tables with doilies, water jugs, and switched lamps, rugs and robes and luggage racks. The back wall of the tent was actually a curtain separating the bedroom from the en suite bathroom. We had a lovely wooden vanity and sink with running water, a flush toilet, and an adjacent rain-head shower. Upon request, our tent butler (yes, we had a tent butler) filled the overhead canvas tank with water heated over a fire for four minutes of hot water under the stars – on safari in Africa. We spent our days driving in the conservancy, surrounded by endless landscapes filled with animals in great number and variety, rarely crossing paths with any other humans. Returning to camp for evening cocktails, or sundowners as they were called, we were served appetizers around the fire followed by gourmet meals in our dining tent, complete with linen tablecloths, china plates, and a chandelier hanging above us. I could have stayed for a week, but there was more of Kenya to discover. We said goodbye to our vehicles and hello to Air Kenya. The nearby private airstrip had a Flintstone-style terminal: no security, no w 40 July 2013 loudspeakers, no Starbucks. Just savor the shade, wait for the plane to land, climb aboard, and take off. How fun flying can be! After landing on the Serengeti plains in southern Kenya, we boarded new safari vehicles and went out in search of the area’s exceptional population of lions. Within the first hour we came upon a majestic pair of males, lolling about in the tall grass next to the road. Seeing lions in the wild is a bit of shock at first as you process the fact that they are real, not in a cage, and not a puppet or a prop from a Broadway musical. Their beauty is truly breathtaking. Across the field we found the females and cubs enjoying a meal of zebra. It was a gory mess, but captivating nonetheless. Our lodging was at the Olonana Safari Camp, a luxury camp and lodge on the banks of the Mara River. The accommodations were called tents, and they qualified as such with heavy canvas walls and ceilings, but with parquet floors, spacious tile and stone bathrooms, and river-front verandas for viewing the resident rhinoceros, they were more like five-star cottages. I loved them, but not the rhinoceros that made a lot of noise at four in the morning. Driving around the reserve in our open-air safari vehicles gave us a front row seat for the Great Migration – the constant movement through Kenya and Tanzania of millions of wildebeests and zebras. When those at the front of the great pack, which stretches to the horizon, reach the river’s edge, needing to proceed across and get water, they take their time, sometimes days, deciding when and where to cross. It is their most vulnerable time, for the wildebeest know that to go the river means that many will drown or die at the hands of predators lying in wait such as crocodiles, hyenas, and lions. Vultures hover above ready for the leftovers. It is a grotesque and awesome scene to witness and photograph, and hundreds of people in safari cars watch and wait for hours, hoping the back and forth movement of the leaders will suddenly begin the crossing of the herd and the subsequent live performance in the circle of life. We watched the zebras and the wildebeests come close to the river’s edge, then suddenly turn and run back, and almost simultaneously the thousands of animals en masse behind them would react through instinct, shifting direction in retreat. It was exhilarating to watch, and while we didn’t witness a crossing, we still relished these few hours of anticipation. While Kenya provides an outstanding wildlife experience and remains a top choice for those seeking an authentic African safari, it was the people of Kenya that made the trip the most memorable for me. Our guides, drivers, and camp staff all had their jobs in the tourism industry and adapted to and provided most graciously the comforts of home and great service up to and exceeding the level of our group’s Western standards. But when their break came, they returned home to their villages and their traditional way of life. They were proud of their families and they still identify with their tribes, either the great warriors of the semi-nomadic Maasai or the Kikuyu, known for their original music and dance rituals. They shared their stories and their culture and their love and knowledge of Kenya with us and were equally as enthusiastic as we were at each wildlife viewing. Near the end of our trip, we visited a Maasai village, where we met the children at school, planted trees together outside their classrooms, and delivered books and supplies donated by the group. Before entering their homes, we received a blessing and Maasai names, then hand in hand and serenaded by the villagers, we passed through the high circular fence of sharp brush. Inside the fence, small huts made of sticks and cow dung and built by the women of the tribe surrounded a smaller fenced enclosure where their cows, whose blood is their primary food source, are kept protected at night. The men of the tribe demonstrated their warrior calls and signature high jumping ritual. The adults knew little English, and only a few of the children knew enough to translate a few words during our school visit. However, it was an honor to meet and know these people who live simply and with respect for their land and its creatures. The movie Out of Africa first introduced them to me, and my connection to Kenya through them is a treasured souvenir—their faces my favorite photograph. Each day, as we experienced something new or beheld yet another beautiful creature, I couldn’t help but think of my family back at home, and I how I wished they were sharing in this amazing adventure with me. Of course, my nature- and animal-loving boys would have adored every minute. It’s my job to create customized family vacations, always considering the children’s special interests and the adults’ needs for comfort. I was there to evaluate Kenya as a family destination, and this trip requires patience, flexibility, and a good measure of grit. It wouldn’t be for everyone, but for many families – my own included – it would surely amount to the trip of a lifetime. Previous articleLook Out For Cash Mob! Martha Grigsby Rhodes is a lifelong Richmond resident, the mother of two teenage sons, a freelance travel writer, and a professional family travel advisor.